VANGO HOGAN HUB EVENT SHELTER - LARGE. The Hogan Hub has generous stand-up height and a wide construction, making this a really bright and airy event shelter. We have included all four doors and a groundsheet so you are ready for any weather conditions. 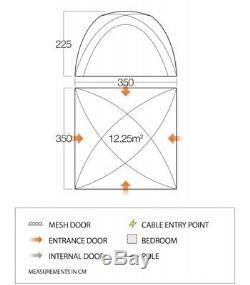 Each door has a mesh panel to keep out the biting bugs and four zips, which means you have complete flexibility to leave them fully open, partly open or fully closed. Vango PowerFlex® fibreglass poles - Create strong, light and reliable structures. All flysheet and groundsheet seams are factory taped - Provides watertight seal. Lantern Hanging Points - Conveniently positioned to attach your light(s). Weather tested to the European standard EN5912 by certified test centre. Fire retardant fabrics - Meets European EN5912 safety standard. High visibility guylines - Easy to see in low light conditions. Vango Protex® 70 denier polyester flysheet, 3000mm HH - Highly waterproof, durable and reliable fabric. Waterproof PE groundsheet - Robust and hardwearing fabric to stand up to the rigours of the most active campers. Flat entry - Easy access for wheelchairs, prams and people with reduced mobility. Handled carry bag - Provides easy transportation to and from the campsite. L68.0 x H20.0 x W24.0cm. 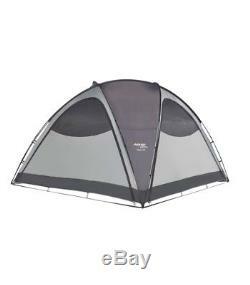 The item "Vango Hogan Hub (Large) Event Shelter Party Gazebo with Sides" is in sale since Saturday, June 2, 2018. This item is in the category "Sporting Goods\Camping & Hiking\Tents & Canopies\Tents". The seller is "summitsonline" and is located in Paisley, Renfrewshire. This item can be shipped to all countries in Europe.